Rogue is a dungeon crawling video game. It was a favorite on college Unix systems in the early to mid-1980s, popularized the dungeon crawling video game and created a class of derivatives known collectively as "roguelikes". Rogue inspired Hack, which in turn led to NetHack. Some of the more notable roguelikes include Moria, Angband, and ADOM. The roguelike genre influenced numerous later games, such as Diablo. 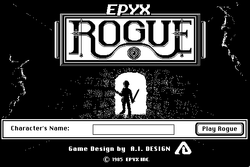 In Rogue, the player assumes the typical role of an adventurer of early fantasy role-playing games. The game starts at the uppermost level of an unmapped dungeon with myriad monsters and treasure. The goal is to fight one's way to the bottom, retrieve the Amulet of Yendor, then ascend to the surface. Until the Amulet is retrieved, the player cannot return to earlier levels. Monsters in the levels become progressively more difficult to defeat. This page was last edited on 6 December 2009, at 02:47. This page has been accessed 17,168 times.